You are here: Home > Gritty Take: Don’t Mind That Man Behind The Curtain! The road isn’t paved with yellow bricks, but if you follow it, you will find adventure. What has that old movie classic to do with riding gravel? Well, in a way, it paints a picture of where I see the gravel scene in 2019. There are maybe a few events, but one that I think of in particular, that has pretty much dominated the media landscape when it comes to any stories about gravel/back road/adventure cycling. It has a “big show”, and a lot of hype, but just as with the movie classic I used as an example, the people behind “the curtain” are really some of the most grassroots folks I can think of. That isn’t the story most people know, and sadly, this event is pointed out as being an example of how “gravel has lost its way“, or how it is an example of why “grassroots gravel is dead“. Sentiments I have seen and heard spoken and written by several riders. This is not reality, of course, but that “yellow brick road” the media paints leads to misguided perceptions. Perceptions that the gravel scene is “the big show” and this has permeated much of the conversation about “gravel cycling” both inside and outside the cycling industry. The “wizard” in this story isn’t the people behind the event(s) which get all the hype as much as it is the folks pushing the keyboard keys who write the stories. The story is being controlled by the ones “pulling the levers” behind the curtains. They are not about to lead you back to the grassroots base that has been, and thankfully still is, the heart and soul of this genre’ of cycling. I’m not sure why the story about grassroots gravel is not being told. Maybe that is because it doesn’t sell copy, advertising, or maybe it just seems uninteresting to those who are charged with writing the tales we see in media. Whatever the case may be, I have noticed a disconnect with what we see as “the story” and what the larger story is in reality. 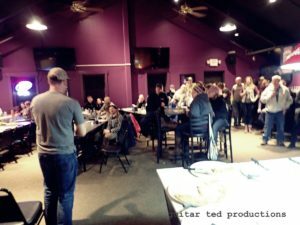 That couldn’t have been more evident than what I witnessed at the recently held “Iowa Gravel Expo/Bike Party”. 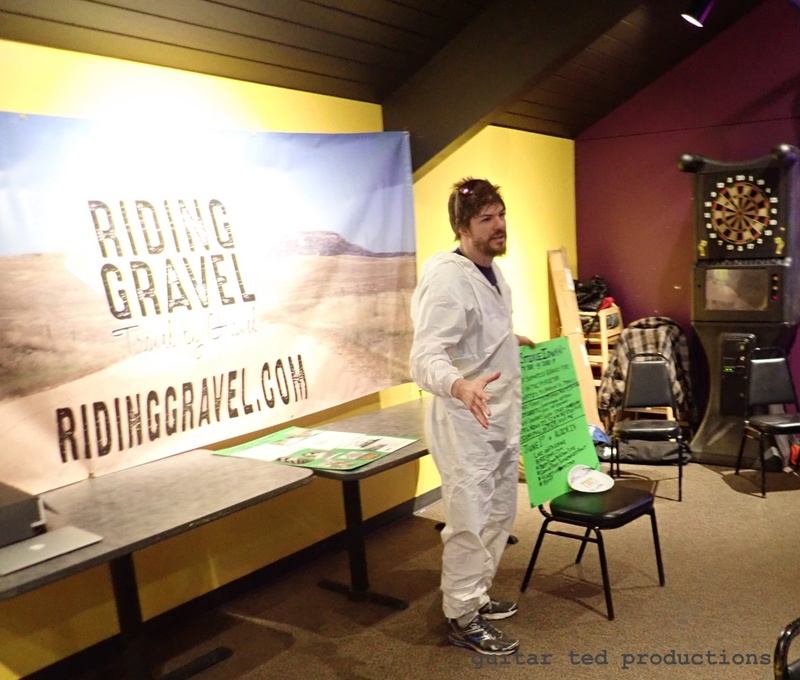 Without getting into a detailed story about what the Iowa Gravel Expo/Bike Party’s history is, I’ll just say that it was a crazy idea cooked up by myself and a friend. The focus of this year’s edition was gravel events based in Iowa. We asked event directors to share what their events were about with whoever wanted to show up for free pizza and a beer. What we heard is just a small part of the bigger story and was literally mind blowing. As if featuring five brand new events wasn’t enough, how about the story of the Lynville Days Rocks and Rolling Ride, a ride headed up by a high school principal and his students who are doing the work to put on the event during a town festival this coming June. The students are doing all the basic leg work- route planning, working with the Chamber of Commerce, finding out about insurance, promotions, and more. The students are even working with another neighboring school district for the designing and manufacturing of trophies for the event. Oh, and by the way, this ride is scheduled to go by a Haunted High School, which you’ll be able to enter during the event, if you dare. How about the Snaggy Ridge 105, an event in its third year, located in Northeast Iowa. One of this event’s goals is to place a spotlight on its host town, Tipton, Iowa. 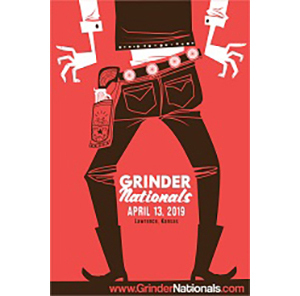 Event director, Dan Roberts, was adamant that the gravel event was making a difference in this rural Iowa town by bringing commerce and eyeballs to the area, which otherwise would not be spent there. The theme of rural towns benefiting from gravel events was not unusual, by the way. That is definitely a story worth telling. This event was Dan’s brainstorm, and his passion for the event, and to make sure the riders have a good time, is palpable. 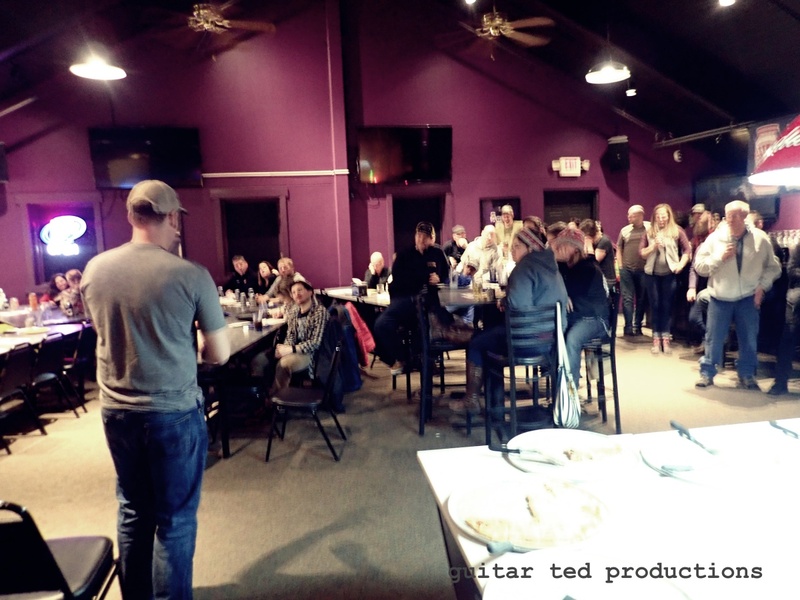 He even hosts a pre-ride event a couple of weeks prior to the Snaggy Ridge 105 at his home with barbecue and beers. I mean, how much more grassroots can you get? Then you have what might be the oddest named gravel event, the “Turds of Misery“. The name of the event was inspired, not by what you might think, but by a band. The “Turds of Misery” were a band who played in and around the same area the race is held in back in the 1970’s. The event directors even wear t-shirt replicas of the shirts that the band wore. Oh, and this event starts and stops at the event director’s home. I’m told it is a fun, lighthearted adventure ride with some pretty gnarly dirt roads. Misery indeed! I get it though. There aren’t any chip timers at events like the Prairie Burn 100, no fancy finish line set ups at ICGravel.There won’t be thousands of people cheering you on at Iowa Wind and Rock, and there are no Pro cyclists entering these events like the MADCO 100. But these events are as “real” as it gets. They are challenges, races, and they are competitive. Some in the media ranks have said otherwise and, quite frankly, they should be ashamed of such remarks. So, when you see the “wizards” in the media talk about the flash, the fire, and the smoke, don’t be bedazzled into thinking that’s how the whole of gravel events are done, and what it is all about. What you see most of the time is about 1% of reality out there. Those “men behind the curtain” might be better served if they were to shed the medicine show and bring the story’s focus back to Kansas and beyond. The focus should be broadened. 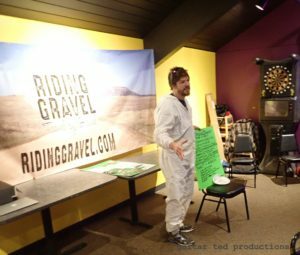 What brought this “gravel”, this back road type of cycling to the fore, and what is attracting more cyclists to it, are events like the ones featured at the Iowa Gravel Expo/Bike Party. Events like most of the approximately 600 events listed on the Riding Gravel Events Calendar. While all types of events are good, and arguably necessary, the narrative that has been told so far about gravel events is pretty shallow. I hope that this changes in the future. 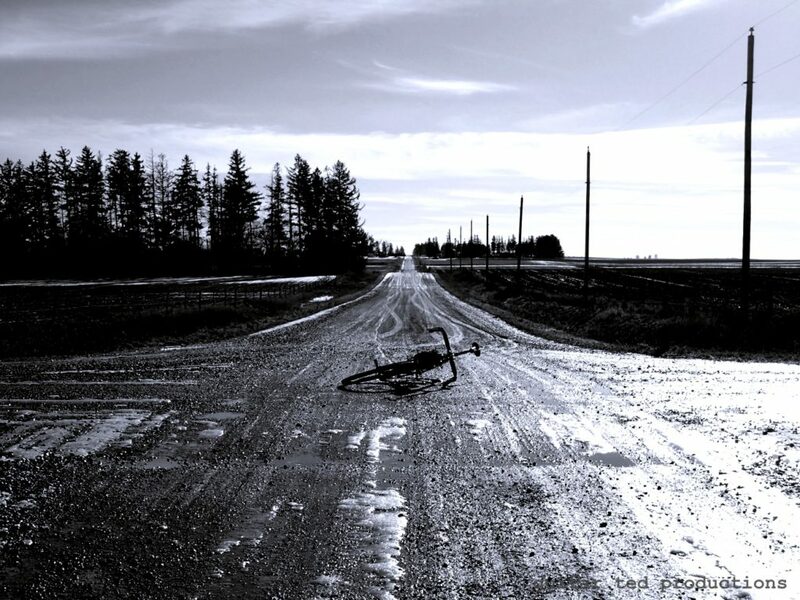 Gritty Take is an occasional feature on Riding Gravel where we allow editorial takes on issues and subjects related to gravel riding. The opinions stated are those of the author and may not necessarily reflect those of RidingGravel.com, its advertisers, or staff. 3 Responses to Gritty Take: Don’t Mind That Man Behind The Curtain! great article. I don’t live in Iowa well really no where close but I appreciate this article. Lot less gravel roads where I live. Great article, GT. The grassroots gravel events of today remind me of the local fun runs of the ’70s put on by runners, for runners: low key, a lot of fun, good camaraderie and healthy competition. As long as runners were in charge, they were usually well done. When outside interests and non-runners took over they invariably became too commercialized and lost the core focus of being for the runners. We’re seeing an explosion of gravel rides and races here in Texas, and I couldn’t be happier. I hope those who enjoy gravel support the sport by volunteering at events and supporting the organizations and sponsors who put them on. Once the Pro Race mentality takes over a bike event, what’s best about it is pretty much gone. I’ve seen it with both Road and Mountain biking events. They’re very cool when they start but once they get so big and the super competitive elite athlete attitude takes hold, little is left for mere mortal riders except to pay to much to enter and get little in return except to say you rode in the same race as the Pro’s. I’ve seen it happen with a local Road race where I live. First, it was a mass start with a festival at the end—very fun. Then it got bigger and the Pro’s started first by their catagories with the citizens race behind. Of course, the price kept going up including the cost of a UCI license and the number of participants was limited and you had to sign-up months in advance. Then the Pro’s started in a different location an hour ahead of the citizens race and by the time the slower half of the citizens group (who were now hours behind the Pro’s) arrived at the finish line, they were folding up the tent’s and the festival was over. No feeling of having a shared adventure. The Pro’s were all that mattered. Needless to say, I haven’t participated in that event for a while.